Q Are all guests required to have a completed/signed waiver? Q What do I do if a parent of a child isn’t going to attend the party and how do I get the waiver for that child filled out online? Have them fill out a waiver online at www.OuterLimitzOrlando.com and bring in a picture or printout of their photo ID (must have full name, DOB, and picture). We do not require reservations for your to come jump. You can come in any time during our hours of operations. Groups of 20 or people must make a reservation in advance. Birthday Parties must also be reserved. Q How do I schedule a Party at Outer Limitz Trampoline Arena? It’s easy! Just go to www.OuterLimitzOrlando.com and at the top you will see a Birthdays tab. Select Party Reservation. You can check availability first if you would like. To reserve, you must register by filling out a waiver then choose the details of your reservation. We will be in touch with you a week prior to your event!You can make any updates when our party coordinator gives you a call. Q It asks for my credit card, is this information secure? We ask for your credit card to hold the reservation and to charge the $75 deposit. The remainder gets charged the morning of your scheduled party. We accept Visa, Mastercard, or Discover. Q Will we have to share the trampoline or party room with anyone else? One of the great benefits of Outer Limitz Trampoline Arena is that you have your own party room! Unfortunately there is no way to block of a section of the trampoline, so you will be jumping with other parties and the general public. Q How many guests can I invite? Please refer to the party package section of the website for the designated guest count. You may invite up to 15 jumpers for our regular package, and any additional jumper is $18 per jumper. Parents of the children attending the party are not included in the guest count unless they are participating in the activities. Q What time should my guests and I arrive at the party? We ask that you and your guests arrive 20 minutes prior to your scheduled starting time to allow for check in and to fill out the waiver if you haven’t already done so. • You will have the party room only during the allotted 2 hour reservation. Q Do I need to stay at the party? All guests must wear Outer Limitz Jump Socks on our trampolines. These reusable socks are available for purchase at our facility for $2.75 (including tax). Q Will Outer Limitz provide supervision on the trampolines? Q Can a guest play while wearing a cast? 1) The cast is approaching its removal date (2 weeks or less) and the cast or splint has no protruding areas that could damage the trampolines. Also note that a child’s center of gravity and mass may be affected by the cast so parents must keep this in mind. The manager on duty ultimately reserves the right to make the call whether it’s safe for the child to jump. Q Can I spend more than the designated playtime on the trampolines? You can purchase additional hours of jump time if you would like. Q Can we start the party in the party room? Q Will there be an Outer Limitz Trampoline Arena staff member available to assist me in the party room? Q Can I use my own decorations and/or paper products in the party room? You’re welcome to use your own decorations and/or paper products in the party room. To preserve the integrity of our party rooms, we do not permit wall or ceiling decorations, streamers, silly string, confetti, or piñatas. Table top decorations are fine. Can I rent Outer Limitz Trampoline Arena exclusively for a Slumber Party or all night party? Yes, you can! We can have events for 50-200 friends. 12:00 am to 5:30 am. Your own custom music along with full access to all party rooms. Sleeping bags on the trampolines are allowed (we do not supply sleeping bags)! Our Slumber parties get rave reviews!! This is great for high school senior nights, all night parties, group events, and much much more. Can I rent Outer Limitz Trampoline Arena exclusively for a private party? Yes, But we are very picky about the timing of exclusive events. The cost to rent the entire Outer Limitz Trampoline Arena exclusively for one hour is $800 on weekdays for up to 50 people. The price for 2 hours is $1,500. This price includes use of our party rooms and includes up to 100 guests; each additional guest is $10. We also have discounted rates for daytime field trips for schools, church groups and educational organizations. Please call us to discuss private party times. We offer one of the most unique fundraisers on the planet; we also offer one of the most memorable slumber parties ever conceived. 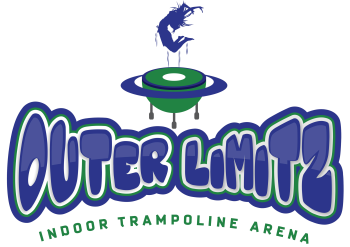 For companies and organizations, Outer Limitz Trampoline Arena is an active, creative and fun way to build team unity. How do I request a donation from Outer Limitz Trampoline Arena? Outer Limitz Trampoline Arena reviews donation requests on a case-by-case basis. You must be authorized to represent an organization and act on its behalf to request a donation. We are located at 6725 South Kirkman Road, Orlando, FL 32819. Our entrance is at the intersection of International Drive and Grand National Dr. Please view the map on our Contact page. We strongly suggest leaving all valuables at home. Bring only what you need to jump. We provide cubbies for your shoes or extra clothes but Outer Limitz Trampoline Arena is NOT responsible for lost, misplaced or stolen items. You may also purchase a lock to store your belongings. Q Do you provide party room set up and clean up? Q Are gratuities (tips) appropriate? Tax and gratuity are not included in the price of our parties. An 8% gratuity will be added to your bill. The total amount will be charged to the card put on file the MORNING of your party. Q What are the beverages you offer in the party room? Q Are there options that I can add to make my party even more special? Yes. We can provide you with balloons, pizza, drink stands, arcade tokens. Additional charges apply. Q When should I order pizza, beverages, balloons, & other options? Q How many slices are in a pizza? There are 8 slices in a large pizza (16 inch). We can box any leftovers for you to take home. Q Can I bring food to my party? You may bring cake or cupcakes. We’re sorry, but no other outside food is permitted due to health codes. Q What if fewer/more kids show up on the day of the party after I have placed my pizza balloons or goodie bag order? Q What if I need to reschedule my party? You may reschedule your party up to 3 days prior to your party. Your $75 is non-refundable but can be used to rebook a party within 3 months. Q Do you have a refrigerator or freezer for my cakes? Q What is your inclement weather policy? A lot of planning and preparation goes into creating a great party experience for you. We come in early and prepare for you, even on rainy days. It is very rare that we will close and cancel your party. We are usually open even when school activities and community centers close. In the very rare case that we must close due to SEVERE weather conditions; it is our policy to charge you for the party you have scheduled, but provide you with a 30-­day window to rebook your party. Must I sign a waiver to enter Outer Limitz Trampoline Arena? Yes, all jumpers AND observers MUST sign a waiver. For maximum convenience, we have developed a state-of-the-art online waiver system that allows you to sign online from anywhere in the world and without printing. You can sign the "eWaiver" at our Waiver Station when you arrive at the facility; or you can sign now from any computer. Anyone under 18 must have a waiver signed by a parent or legal guardian. If you are bringing children or teens who are not your kids — for birthdays or play dates – please remember to get waivers signed by their parents online at www.OuterLimitzOrlando.com and bring either a picture or printout of the parent's ID. Permission by phone or email is not sufficient. Once you have a signed waiver on file, it is valid for subsequent visits at Flight for one full year. Please note that we can no longer accept printed paper waivers. Okay, so there are trampolines...but what else can we do at Flight...? Check out our Hours/Pricing page for all the info! Is Outer Limitz Trampoline Arena dangerous? Like any vigorous sporting activity, injuries can and do occur. However, injuries are rare and usually quite minor. A recent study of trampoline parks across the US found an injury incident rate of 0.02%, with the most common injuries being trampoline burns and bruises. Trampoline Parks have a better safety rate than any competitive sport; even safer than bowling! Follow our safety rules and the chances of injury are even less. Do I need to buy Advance Tickets to jump at Outer Limitz Trampoline Arena ? No. Walk-ins are always welcome. You can pre-purchase your flight time by purchasing tickets online. All tickets are non-refundable. When is Outer Limitz Trampoline Arena Open? Please see the Hours/Pricing Page. You must be 13 years or older to be dropped off without an adult. Yes, you may go watch from the entrance of the Trampoline Arenas as an observer without purchasing a jump pass. You must be 13 years or older to be dropped off without an adult. Something comfortable! You will be having a blast and getting a great workout so exercise gear is fine. Outer Limitz Socks are required on the Trampoline Arena. Outer LImitz Socks are available for sale at the Park with "grippy" bottoms that help you get the most out of your jumping experience. Price is $2.75/pair and can be purchased at the Park. Shirts must be worn at all times. Does Outer Limitz Trampoline Arena do Birthday Parties? Yes! Please go to our parties page to get more information! NO refunds or rescheduling pre-purchased flight tickets.